How can I setup an internet connection through LAN over PPPOE (wired DSL or landline) connection? 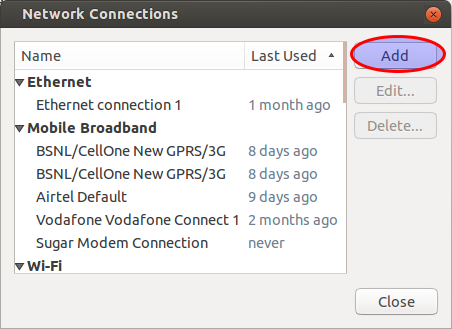 You can setup your internet connection using two methods. One is by using the GUI and other is using the terminal (command line). 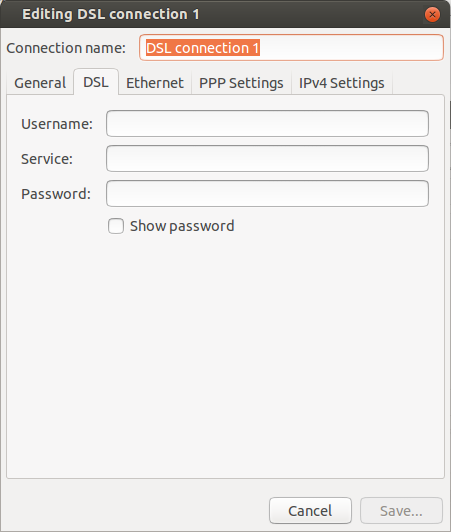 This method is for configuring your DSL connection using the GUI method. First open the dash and search for network connections. Click on the network connections icon shown in the search results. Now a new window will open. Select DSL from the options. .Now click on create. A new window will open. Now type your username and password that your ISP gave you. Now click on save. You can even choose to connect automatically in the general tab. Confirm that your Ethernet card is detected. Enter your username (provided by your ISP). Enter your password (provided by your ISP). If you already have a PPPoE Connection configured, you will be asked if it may be modified. Popular options: you are asked if you want the 'noauth' and 'defaultroute' options and to remove 'nodetach' - choose "Yes". Use peer DNS - choose "Yes". When you are asked if you want to connect at start up, you will probably want to say yes. (This option does not work) See the secton "Connecting on Boot"
Finally you are asked if you want to establish the connection immediately. Once you have finished these steps, your connection should be working.